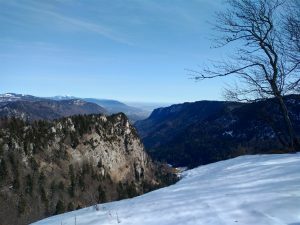 Le soliat mountain is situated in the Jura mountains and offers pretty stunning views of the surrounding area. 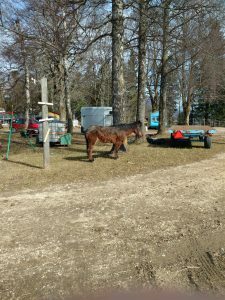 It is quite close to Neuchatel city, it’s summit is 1465 m so it is not as high as Alps can be, but it’s definitely a place to visit, especially in Spring time when most of all Alps summits and mountain passes are covered in deep snow. 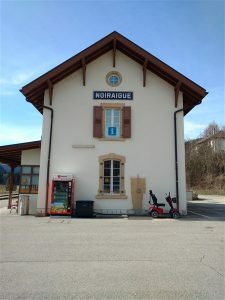 We started our trip in a small city of Noiraigue which offers free parking space in the centre of town (free parking in Switzerland is more an exception than a rule, so keep that in mind and have some change all the time). 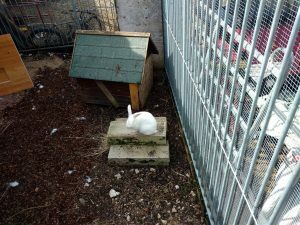 Right next to the parking spot there’s a train station and tourist information centre (picture on the left) which has huge amount of different leaflets to choose from (there was no person who is working in that centre, so you have to choose on your own). 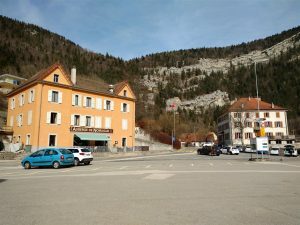 I took a leaflet which offered 20 must do hikes in Jura and it has plenty of information about hikes you can do in the surrounding area. 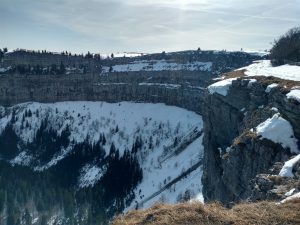 I knew that we had to go to the Le Soliat mountain (cliff) and simply chose the 5th route. In the beginning it was pretty easy and the elevation rise was quite mild, the weather was quite cold (around +2 degrees) and we saw frost on the meadow next to our path. And just after the farm the real fun began. 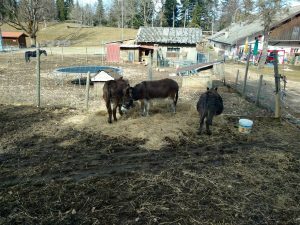 As I said, the temperature was quite low at the time, and definitely the spring didn’t have much time to melt all the snow on the mountain. Before this trip I was pretty sure that we may experience some snow at that altitude at this time of the year, but I definitely underestimated the levels of snow we will have to overcome. The worst thing was that most of that snow on the path is so compressed that it simply became ice and the hiking with simple running shoes was quite complicated. I know I know, how could I use running shoes when hiking up the mountain, but as I knew that the hike won’t be that long, there won’t be any rocky roads and the temperature is quite comfortable, I chose to go with running shoes… and it was a huge mistake 🙂 Still, my hiking boots wouldn’t be of much help as it was very slippery and my hiking shoes doesn’t have very hard grip on the ice. The best solution there would have been snowshoes or hiking shoes crampons. We took some time to relax, enjoy the view and eat a little. There’s a restaurant right on the top, but I assume it is closed, because not so many people go up at this time of the year. As we got down to Noiraigue, the temperature was around 12 degrees, so the weather was really nice. 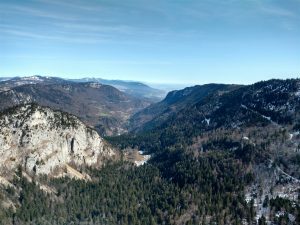 Jura mountains are maybe not as breath taking as Alps, but it’s definitely very good idea to enjoy them at this time of the year (on March). 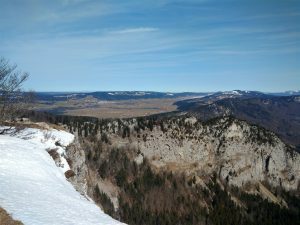 Le Soliat is on of the top spots in Jura mountains, so give it a go 🙂 The temperatures are very mild and hiking is not too complicated.